So what are you making with your Thanksgiving leftovers, Austin? Today’s off-off-topic (kind of like off-off-Broadway but without the pretentious audiences) is a “What to Do With Your Thanksgiving Leftovers” cook-off on Google Plus. There was three of competing, plus an awesome judge and timekeeper (sucking up? You bet!) and a fun audience. The challenge? Come up with a creative way to use Thanksgiving leftovers to make a tasty Black Friday meal. And we all jumped right into the challenge. 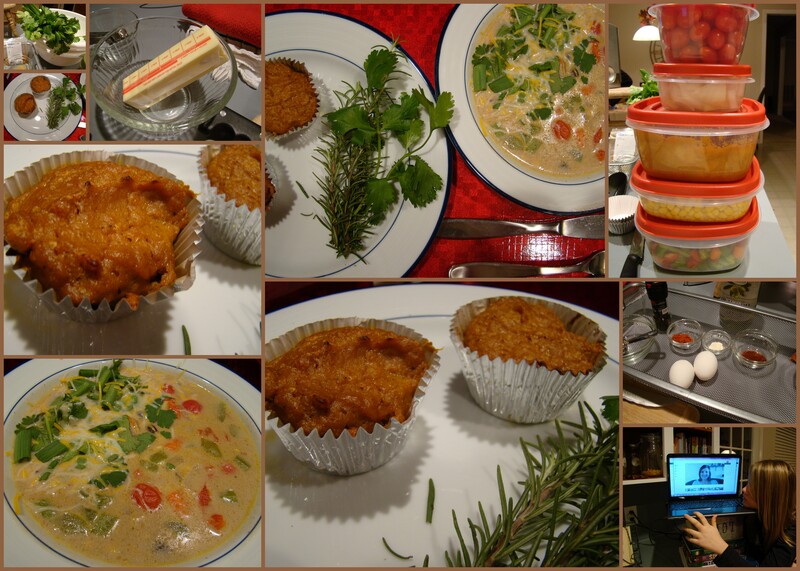 We each cooked in our own kitchens, and shared the event as a live Google Hang Out. The first competitor was Mary Helen Leonard of Mary Makes Dinner. She crafted her Thanksgiving leftovers into a tempting-looking Turkey Day pizza. The second competitor was Amy Kritzer from Kosher food blog What Jew Wanna Eat and a series of regular cooking demonstrations from Google Austin. She turned her Thanksgiving ingredients into a delicious looking Thanksgiving Benedict. My creations were a bit different. Because we are vegetarians (or at least 2/3 of the household is; my husband eats, well, pretty much everything!) , I skipped over the turkey and went right for the leftover veggies and stuffing. And because we’re living in Austin, I opted for a local flavor, too. 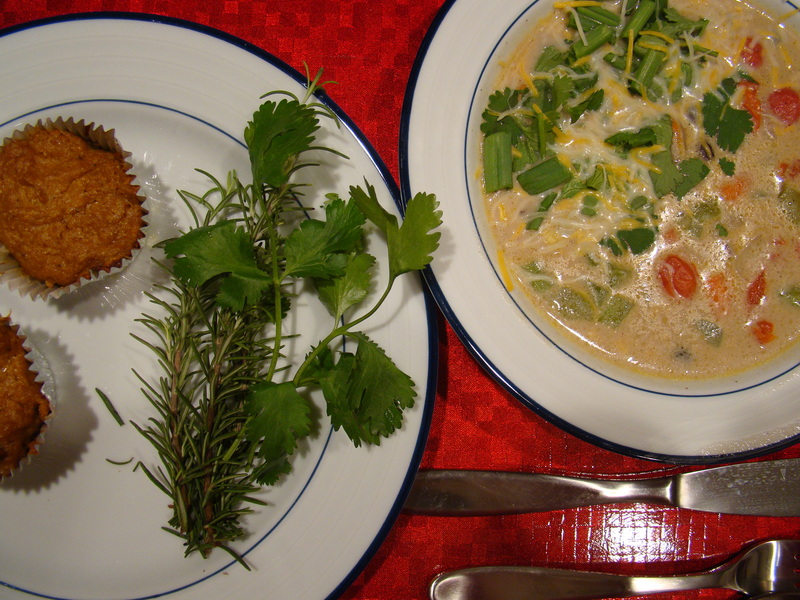 I started with a Southwest Corn Chowder, full of chopped veggies from the vegetable tray, corn, mashed potatoes and an array of smoky spices. 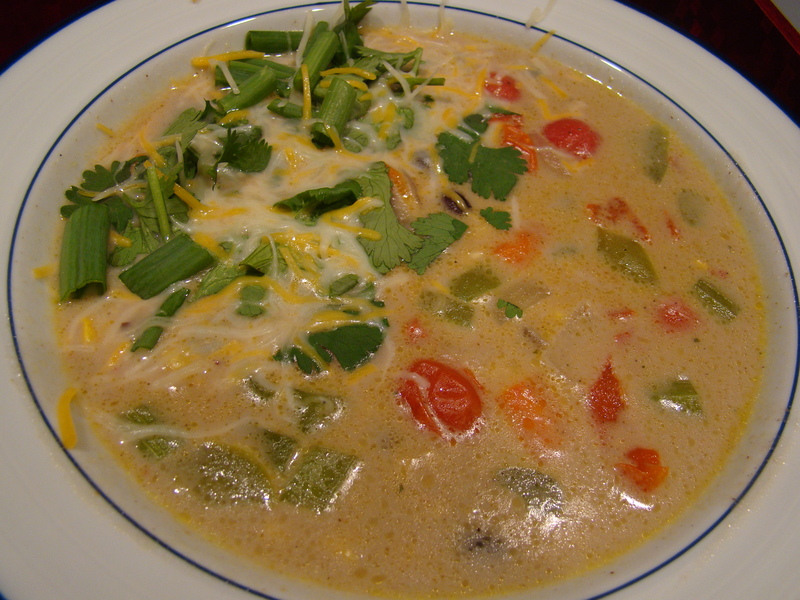 The soup was finished with a dash of cream, and garnished with fresh cilantro and a sprinkling of Mexican cheese. I also made a dish with leftover sweet potato casserole and stuffing, combining the sweet with heat by adding cayanne, San Antonio Chili Powder, a touch of garlic and some hot Paprika to the potatoes and then whipping them with eggs and egg whites. 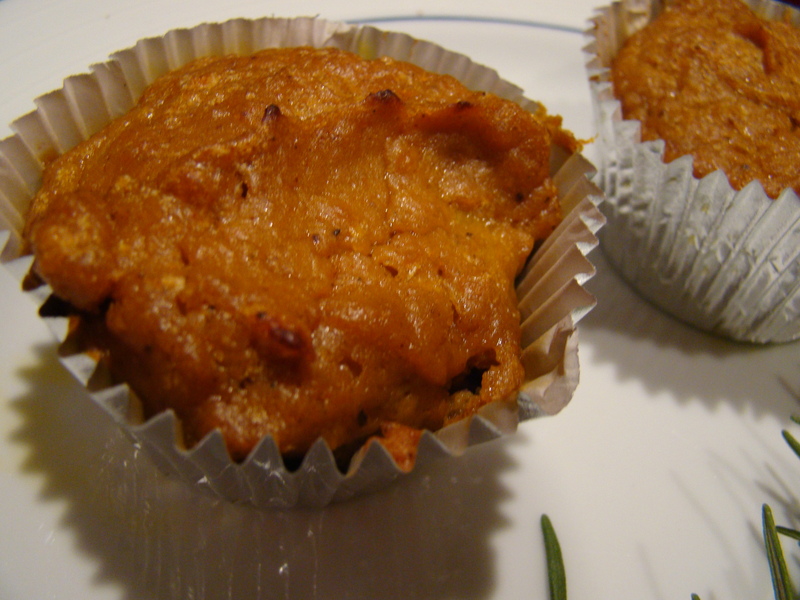 That became the soufflé to top a crust made of twice-baked stuffing baked in muffin cups. I was going crazy getting ready for the event, but I had so much fun doing it! If you want to see the video, check it out on Google+. And don’t forget to vote for your favorite chef! There are prizes afoot, so click here to pick your number one choice! This entry was posted in X is for X-tras & Everything Else and tagged cooking, food, google, holidays. Bookmark the permalink. Thanks so much for participating in the hangout, Lindsay! Your dishes look great! Thank you for hosting, Mary Helen! It was fun!